Nova Scotia Liquor Corp. president and CEO Bret Mitchell displays the cannabis section of a hybrid liquor-cannabis store in Halifax on July 18, 2018. Nova Scotia has unveiled what is believed to be the only retail model in the world that combines liquor beverage sales with recreational cannabis under one roof. A dozen of the hybrid stores, operated by the Nova Scotia Liquor Corp. (NSLC), will be open for business on Oct. 17, when recreational cannabis officially becomes legal in Canada. Each store will sell cannabis separately from alcohol in what is essentially a restricted-access boutique retrofitted into some of NSLC’s stores. They feature trendy design elements such as wood-like panels and sleek tiled surfaces, but are designed in compliance with federal regulations that make it unlawful for underagers, meaning those under the age of 19 in Nova Scotia, to see or even be inside the store. Shoppers will enter the cannabis sales area – labelled Cannabis and located at the rear of the NSLC stores where possible – through a discreet entrance lined with white subway tile and frosted glass. The doorless setup is akin to public bathroom entryways in stadiums and airports. The aim was to create “privacy without barriers,” said Bret Mitchell, president and chief executive of the NSLC. Once inside, customers will be greeted by a “host,” who will make what Mr. Mitchell called “a triage assessment” to determine whether they know what they want and can step into the lineup at the sales counter – where a staff member will prepare their order and take their payment – or whether they need a consultation with an educated staff member first. One of the NSLC’s top concerns, Mr. Mitchell said, is controlling the flow of traffic and wait times. 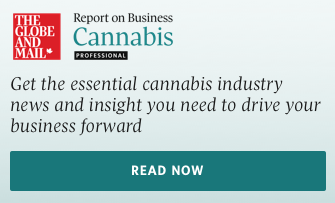 Colorado, Oregon, Washington State and other markets where recreational cannabis is sold all reported early-stage problems with in-store traffic flow owing to high demand and the complex buying process when NSLC staff consulted them. Mr. Mitchell said his plan is to mitigate those issues as much as possible. Part of that process involves preparing customers for inevitable waits and long lineups. 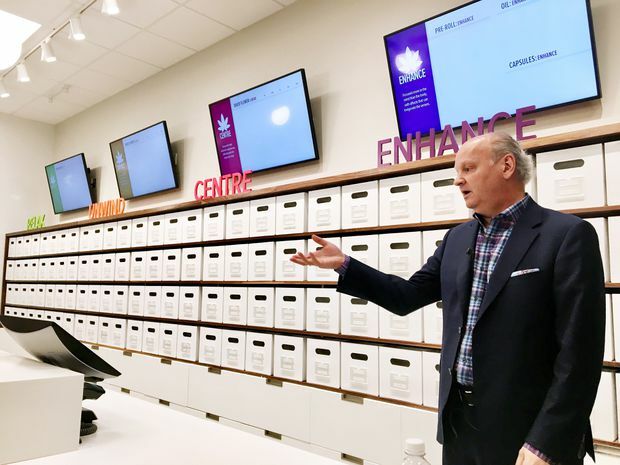 While an average liquor-sales transaction at the NSLC usually takes about three minutes – and the beverage retailer aims not to have lineups longer than three customers – a cannabis transaction could take 15 or 20 minutes, Mr. Mitchell said. The cannabis area of the Halifax store he unveiled on Wednesday fits 60 customers “comfortably,” but can hold up to 90. Mr. Mitchell said the staff fully expects lines that snake out the door. Sales for that store, which sells $11.5-million in alcohol annually, are forecast to hit $22-million once cannabis is available. The NSLC is encouraging customers to do advance research online through its “discovery guide.” Customers can also access that guide in-store, at tablet stations that would not look out of place in a trendy coffee shop or electronics store. Mr. Mitchell said about 75 strains of recreational cannabis will be on offer in October. They will be divided into four categories: Relax, Unwind, Centre and Enhance. Each is meant to conjure associations for customers, Mr. Mitchell said, noting staff will be trained to help with purchase decisions, but will not provide medical advice. Each Nova Scotia cannabis outlet will open with a total of 200 products. In addition to dried flowers, cannabis oil and capsules, a small selection of cannabis accessories such as rolling papers, grinders, safe-storage containers, pipes and vaping devices will be available. Jars of cannabis samples will be displayed in cases on the walls. Customers will be able to touch or smell the product at only one of the NSLC’s 12 stores – located on Clyde Street in Halifax – owing largely to concerns beverage customers “may find the odour offensive,” a spokeswoman for the NSLC said. Display cannabis will have written descriptions regarding the “nose” of the product. Retail containers will be stored behind the main sales counter in rectangular, white cubbies that appear much like a sleek filing system. Federal regulations on packaging are still in development. But customers who buy cannabis, available in increments of one, 3.5, seven, 15 and 30 grams, can expect to leave the store carrying a sealed brown-paper bag similar to those given with beer and liquor. People who bring along children will likely leave empty-handed. While the NSLC allows customers to tote kids while they buy a bottle of wine or a case of beer – often after getting groceries at the stores attached to many liquor outlets – they will not be able to buy cannabis with children because of the underage regulations. “We will be politely asking them to come back at another time,” Mr. Mitchell said. The federal decision to legalize recreational cannabis was aimed at improving safety and keeping the substance out of the hands of youth. The unveiling of the NSLC store comes about a month after New Brunswick offered a sneak peek at its Cannabis NB outlets. Those stand-alone stores also feature bright, modern layouts with trendy design features – reclaimed wood, sleek glass, white and grey surfaces – and will classify products under the categories Discover, Connect and Refresh. Efforts to educate consumers on the new law and cannabis generally have also begun. Nova Scotia Justice Minister Mark Furey said the province’s Be In the Know About Cannabis campaign, which launched this week, is designed to give consumers basic information about use, health effects and the legalities of where they can and cannot consume. One video tackles the subject of impaired driving and cannabis, while another helps brace parents to field cannabis questions from their teens.